BALTIMORE (AP) -- Operating with little sleep and much emotion, Torrey Smith played a magnificent game under the most difficult circumstances. His teammates on the Baltimore Ravens helped Smith cope, then provided him a victory for his effort. Playing less than 24 hours after his younger brother died in a motorcycle accident, Smith scored two touchdowns and caught six passes for 127 yards. Only hours earlier, he wasn't even sure if he would suit up. Smith left the team hotel at 1 a.m. Sunday to be with his family. Upon arriving at the stadium, the familiar surroundings helped Smith get ready to go. ''It means a lot not just for us but for my family. ... That's for my little brother,''' Smith said. In the previous meeting, Billy Cundiff missed a 32-yard field goal in the closing seconds. In the encore, Tucker - who took the job away from Cundiff in training camp - drove his kick just inside the right upright. 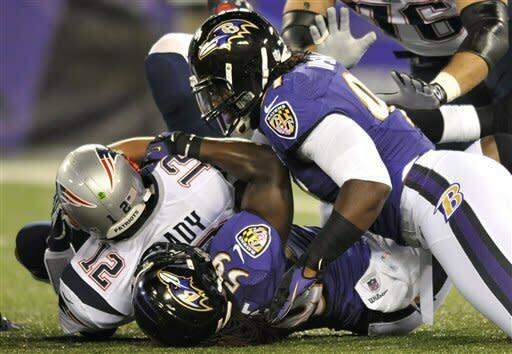 The game-winning kick followed a pass interference call against Devin McCourty, who was covering Jacoby Jones. Actually, 24, including 14 against the Ravens for 135 yards. New England led 13-0 after the first quarter and 30-21 with 14 minutes left, but couldn't make either lead stand up. Wes Welker had eight catches for 142 yards and Brandon Lloyd caught nine passes for 108 yards for the Patriots, who fell to 6-1 against the Ravens in the regular season - 7-2 including the playoffs. Down 20-14, the Ravens opened the second half with an 80-yard drive that ended with a 7-yard touchdown run by Ray Rice. Brady matched that with an 80-yard march of his own, repeatedly picking on cornerback Cary Williams, before Danny Woodhead scored on a 3-yard run to put New England ahead. NOTES: Baltimore amassed 503 yards in offense. Rice ran for 101 yards on 20 carries. ... Edelman left with a hand injury. ... Baltimore punted only three times.